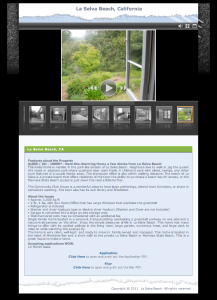 I experienced first hand the benefits of having a website advertise a business, a family rental property. For 2 months the place was shown and received minimal, sporadic interest in it, even though it was adorable and within walking distance to a beach. It was advertised with open houses in the local newspapers, on Craigslist.org, etc., but had very little response. 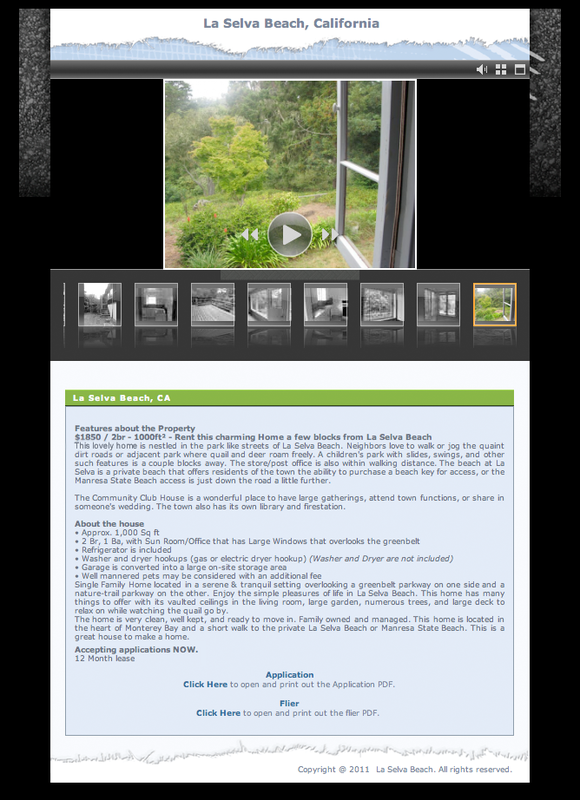 Finally I decided to create a quick, one page ad for the rental on my own website with a full slide show that not only included the house and garden, but the wonderful quail that frequented the area. I linked the ad to its Craigslist ad on a Friday night. The next Saturday the place received an overwhelming amount of potential renters at the open house. Each group referred to the website and was drawn in by the pictures. It was a simple site created quickly, but it did the work perfectly. The place rented that weekend. My point is, you just need to be out there with pictures. Truly, they speak volumes. What is an effective method to reach new customers? What New Media options are best for my company? Where do I go to quickly learn about the New Media? Once the New Media is in place, how do I get it seen by the most customers? 1. First off, postcard mailers and a website are two great places to start. Contact me, so I can assist you in creating a presence in your territory and on the internet. 2. The next logical step after setting up your website is to create a blog. Blogs are very useful because they offer a “New” information that entices your clients to come back to your website to see what interesting things have been added. They are relatively easy to set up and maintain. One of the most difficult parts may be finding new and interesting data to add to it. There are also many social networking options to chose from, but for now, I suggest focussing on setting up your website and blog and save the social networking information for the next phase. 3. Lynda.com and Safaribooksonline.com are two really good places to learn about how to create a blog amongst other such useful information. Those two internet tutorial companies offer a wealth of knowledge. It doesn’t cost anything to see what they have to offer. Check them out before you subscribe. 4. Search Engine Optimization or SEO is the path needed to get your website visible to a vast number of clients on the internet. Since it deals with code, it is much more complicated than creating your own blog, so we offer SEO services through Windstone Graphics and Printing. You can pick a monthly package deal to have the SEO managed for a time period or a one time SEO refinement package. Strategies for marketing your business vary from field to field, but 2 things are common for most businesses, the need to get an online presence and the need for your local customers to become familiar with your company and remember you. One approach is to send out email newsletters. This approach should be used with caution and with the permission of the recipient of the newsletter. Too many hits into a client’s inbox may have a negative affect and feel like a nuisance to them. But, if you have permission to send them quarterly emails, this is a good, inexpensive way to reach out to your current client base. It also helps to sweeten the deal by including a coupon. Coupons both offer a treat for the customer and are a good incentive to draw them into your business. Pictures speak volumes about the sophistication of your email newsletters (eNewsletter). If you need help setting up a professional eNewsletter, we can help. Contact us for details. Postcards mailers are another great marketing tool. I had one client that received so many calls the day his postcards arrived in the mail to his clients that he was overwhelmed with business for weeks. See my website under featured clients for images of his postcard campaign. Other great marketing tools are small token gifts, like business card size refrigerator magnets, bookmarks, “to do” lists, notepads. Offer these with an aesthetic or funny image, something that will make them want to keep and display it. Keep your business information small on these. Remember, it’s a gift, not a business card. Think about it, would you put someone’s business card on your refrigerator? Most likely not, but you may put up a nice picture on the ocean with a tag line on the bottom that read “compliments of Windstone Graphics | www.windstonegraphics.com”. OK, I just plugged my own business, but you get my drift. Make the gift useful and enticing to keep, so it is around for a long time keeping your business subtly but consistently in your client’s mind. Plus, if you offer coupons or gifts above what your competitors offer, clients may prefer your services over other similar businesses. I hope my opinions about these simple marketing ideas help you. Keep plugging your business. I believe a down market is the time to promote the most. When the market turns, you want your business to be front and center for your clients and potential customers.